Entrepreneurship is becoming increasingly popular in today’s economy. Students graduating from colleges are turning towards entrepreneurship as a viable career choice. A survey by global recruiting firm Randstad noted: of the 400 workers surveyed in India, 56 percent considered quitting their jobs to start their own business. This was the highest percentage globally. Entrepreneurship also helps in the development of the workforce and to create jobs. Interestingly, the United Nations World Employment and Social Outlook 2017 report acknowledged that India was responsible for maximum job creation in 2016 in the Asia-Pacific region. Entrepreneurs have gained the reputation of breaking out of the mould and go after achieving and materialising their dreams with utmost hard work and dedication. For many ambitious students and professionals alike, the benefits of entrepreneurship are extremely rewarding. When you’re self-employed, you get to choose how you run your business. It allows you to align your business with your core values and what you’re passionate about. You can follow and realize your dreams, seek opportunities that match who you are, what you want to be, and how and where you want to live. Thus, you control your day and what you do when being self-employed. Starting your own business drives you to constantly improve your skill set. Entrepreneurs play many roles, like that of the strategic planner, the marketer, the customer service representative, the sales representative, and even the book-keeper. You are always adapting and learning to fulfil these roles and these skills, in turn, enrich your personal life as well. When being self-employed, you will never stop learning and growing. Problem-solving is one of the most important aspects of entrepreneurship. As being both, the founder of your business and leader of your team, the responsibility of identifying the problems and solving them falls on you. You learn how to solve problems well and enhance your problem-solving skills further. When you’re self-employed, you get to set your own wages and make further investments in your business. Being an entrepreneur means you can receive the benefits of all your hard work. There’s no cap to your earning potential when compared with an employee in a company. In your business, your rate of success depends on you and so do your earnings. Many people believe that to be ‘secure’ you must have a job and a steady paycheck. However, in certain ways, that entails sacrificing your freedom and taking orders dutifully in order to get that paycheck. When you get an increase in your income, it is your boss’s decision, despite the effort or time you’ve put into your job. 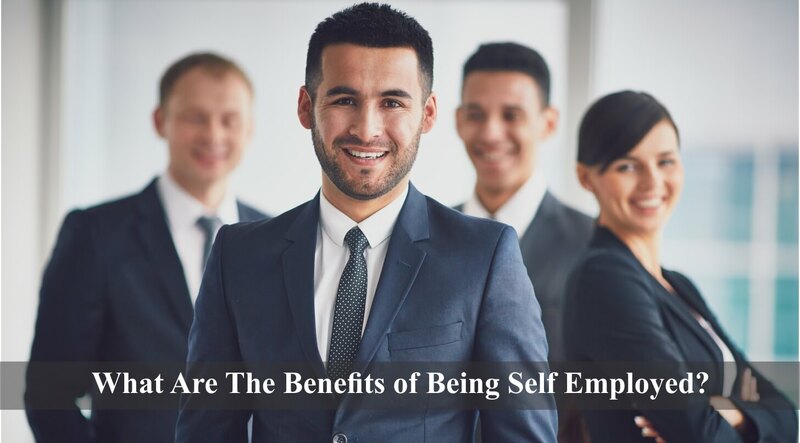 Comparatively, when you are self-employed, you relieve yourself from the possibility of being laid off and reap more financial benefits for the time and energy you put into your work. As your own boss, you get to choose when you want to work. Being self-employed means you that you do not have to follow the conventional ‘9 to 5’ work hours and can instead set up a schedule that is suitable for you. You can decide your work hours around your lifestyle and partake in various activities that you wouldn’t be able to do otherwise. You can schedule your work as you deem fit, giving you time to spend with your family. You have the liberty to work as you wish. Summarily, self-employment means freedom from rules. When you are self-employed, you keep developing your personality through the different things you learn. You become more accountable for your actions in your day to day life. You learn to support your peers better and develop skills like perseverance and become more accommodating and therefore witness an overall improvement in the quality of life by imbibing these skills. Also, when you do what you’re passionate about you become more confident in both your business life and your personal life. You not only enhance your quality of life but also that of the people around you. Entrepreneurs find solutions to the problems that the consumer is having. By doing so, you are making their life more convenient and enjoyable. You also improve their lives by creating employment for the public. Entrepreneurship also urges you to be creative. Though creativity cannot be learned, it can get better with practice and time. The more time you spend on your creative ideas, the better and faster you can implement them in a practical world. The current business practices can be improved too with enhanced creativity. Creativity helps you develop new ways of improving an existing product or service and optimizing a business. When entrepreneurs can think of an idea that is different and also feasible, they have an upper hand in the market. Imagination is required to cross the line of “normal” and “mundane” and do something different. Entrepreneurs have to link their creative mind and business mind for a successful business. Being an entrepreneur allows you the freedom of choosing your partnerships. You get to decide what relationships benefit your business and which partnerships to pursue. You have control over all your business relationships. You will never hit a dead end in your career as an entrepreneur. Most jobs have a growth cap and you can only advance thus far despite the time and effort that you’ve put into the job. When you are an entrepreneur, there is no growth ceiling, your advances and profits all depend on the work you’re doing. Starting a business can feel like a big responsibility if you don’t know how to run a business. People tend to shy away from the idea because of the risk but there are also great rewards to be reaped for those who are willing to take the plunge. Entrepreneurship provides a unique opportunity to create an interesting career path and can be very rewarding too. It helps you achieve the lifestyle you have always dreamed of when you put in the the effort into it. With the desire and zeal to create a better life for yourself and your family, you can be successful and this is the number one benefit of being an entrepreneur.